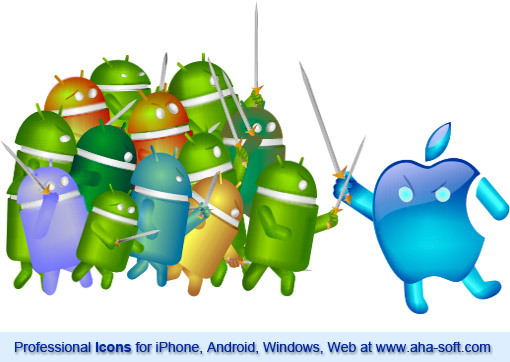 Android or iPhone? The debate goes on and on. When the iPhone was first released, there was really no competition. Apple was playing in a class of its own. First Android devices were mediocre: sluggish UI, lags here and there, and the overall “assemble-it-yourself” approach just didn’t with consumers. Today, the market has changed. With the latest iPhone being a superb device and a wonderful system, the latest Androids leave little to be desired. Today’s Androids have no UI lags, feature most of the same apps in the Google Play store, and went away with the do-it-yourself, LEGO type approach. Today, choosing one phone over another is more of a personal preference. Let’s try to find out what’s good about going the Apple route, and what advantages the Android way can bring. With Apple, you have a limited choice of only several models. Or, rather, you can choose from just one current model in several versions that, honestly, differ very little. There are a few older models available from the used market, but that’s about it. “You can have any color as long as it’s black”. Android devices, on the other hand, come in all sorts of shapes, models and colors. Various manufacturers use completely different hardware. Different screens, processors, memory. Vastly different reliability and usability. Buying an Android phone will require you to do a market research, whereas you can’t go wrong with any current iPhone. Are you a techno geek or a gadget guy? Look for an Android phone that flies with you. Others will be served by Apple. The latest generation of iPhones has a great Retina display. These super high pixel density displays will display your apps, icons and pictures so crisp it’s hard to believe. Kudos to Apple: they made one of the greatest screens ever. Androids come with all sorts of displays. Some of the better ones can match iPhones in pixel density, but software integration is still something to work on. Many apps are still using low-resolution icons and graphics designed to be shown on lower-resolution screens. When selecting an Android phone, you will have to look really carefully to buy a model with a good display. If you’re not friends with numbers, icon resolutions, angles of view and technical specs, just get an iPhone for the best screen ever. An iPhone is an iPhone. They’re all the same. A single operating system, same user interface, the same set of pre-installed apps, same icons. You can customize it by shifting stuff around and choosing a few icons on your own, but there’s only so much you’re allowed to do. Androids are available in many flavors. Different firmware and dozens of OS versions, builds and codenames. Different sets of icons for same apps. Completely different shells and launchers. Extensively customizable: you can make Android phones look like whatever you want (and it’s not just about custom icons) – but you have to know what you’re doing. With such a broad variety, some devices are simply better as in easier to use, more stable and working faster than others. If making your very own tailored environment is fun for you, by all means get the Android. If you like it working out of the box, get an iPhone and begin using it right away. iPhones don’t have a slot to use an external memory card. You’ll be stuck with the amount of memory you originally bought. If you outgrow your iPhone, you’ll have to get another iPhone, bringing more money to Apple. Most but not all Android phones come with a microSD extension slot, allowing you to add more memory when you need it. With flash memory getting cheaper every year, you will be wealthier in the long run if you get an Android. With iPhones, you can’t even swap a battery. If your battery dies in some years (they all do; lithium batteries die in 3-4 years), you’ll be mailing your iPhone back to Apple for a “major repair” (more money to Apple), or be on the market for a new iPhone (even more money to Apple). While some Android devices use similarly user irreplaceable batteries, most devices are easy: just lift the back cover and throw a new battery in. A replacement battery will cost a few dollars, allowing you to buy a replacement phone when you want it. Android phones are more affordable to buy and cheaper to upgrade and maintain. They’re more extensible and customizable. iPhones are perfect straight out of the box, and offer one of the best usage experience ever. Which one to pick? The choice is yours.